Last week I borrowed a flax break from Kathy Furst Coache, fellow weaver and flax aficionado (check out her shop and classes at http://www.westfieldyarn.com/). It’s a lovely antique, and it was very kind of her to loan it to me. 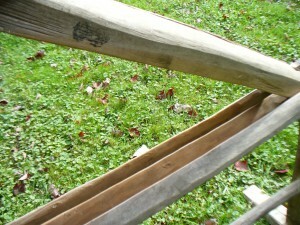 A flax break (or brake) is one of the tools used to process flax, which is the plant that linen is made from. To make linen, you want the bast fibers, which are the long, strong fibers that run vertically the length of the stalk, between the skin or bark and the woody core (as I understand it, these fibers are basically the phloem of the plant–N.B. June 2017 update Actually, the fiber bundles in the flax stem are their own structures, distinct from the phloem! Sorry for the misinformation.). After harvesting, you dry and ret the flax. I will go into my personal retting history in another post. 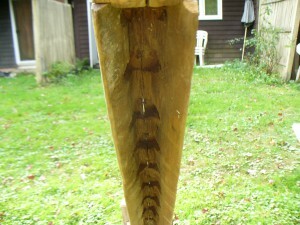 After retting, rinsing, and drying again, you use the break to smash up the woody material. The bed of the break. 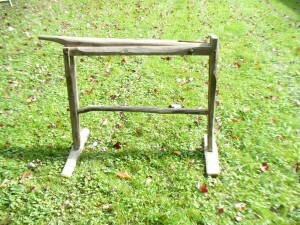 Insert the flax close to the pivot point between the bed and the arm. 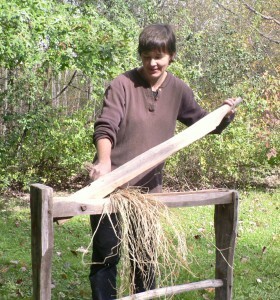 Using the break involves repeatedly slamming the arm of the break down onto a handful of your retted flax, and partially crushing up the woody material. The shives are the short pieces that have broken off the stems. 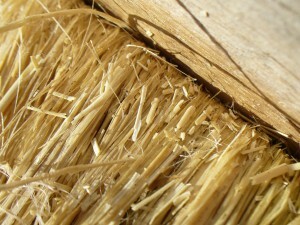 If the flax has been retted properly, the woody material, called shives or boon, should pop off and separate from the bast fibers. Well, it’s not exactly woody. It’s sort of like very stiff straw, but it can give you splinters. My hoard of retted flax consisted of 3 years of flax harvests from 2007, 2008, and 2010. I’d been storing these in three storage bins (43”x19”x6.5”) and two bundles that didn’t fit into a bin, which had been crammed into our hot water heater closet. One bin had been living under the bed, and two in the closet in the bedroom. This year’s crop is rolled up like a dead body in the back of the car. (I am planning to save the seed, but that’s another post). I made the most of the glorious sunny weather on Saturday October 22nd, and Monday and Tuesday the 24th and 25th, since rain and snow were in the forecast for later in the week. For those three days I worked for 8 hours each day. Maybe I would get faster with more practice, but it was slow going! It alternated between being really fun and satisfying, and really boring and tedious. In three days of steady work I managed to break the contents of two out of the three containers, plus the loose bundles. Here are some of my results. Two bundles of broken flax and one not yet broken. 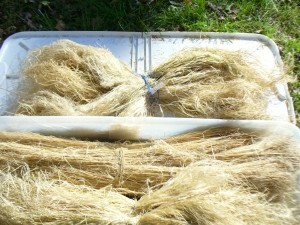 After breaking, there is scutching or swingling to remove the rest of the shives, then hackling (or heckling or hetcheling) to separate the shorter tow fibers and straighten out the long line fibers. Then, finally, you can spin your yarn and weave your cloth. Phew! Talk about slow cloth. This project takes the cake–slow, slower, slowest.